Mr. Rogers said that his mother told him in scary times to look for the helpers. Today, UU A Way Of Life is beginning a new column called, "The Helpers." This column will share stories of who the helpers are and where they are working and how they make the world a better place. Be personal. Reach out in person, or on the phone, rather than online. While social media has opened more channels to express sorrow and offer condolences, it’s not the same as personal connection. Be specific. Instead of saying “Let me know if you need anything,” offer to put up lights, address cards, carry a tree into the house, bake cookies or take children shopping. Be inclusive. Invite those who are grieving to a holiday outing or gathering. (You might want to avoid using the word “party.”) If they aren’t feeling up to it, they can always say no, but they might want to be with others. Be flexible. 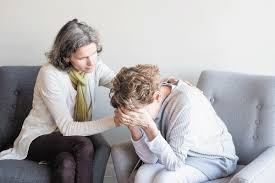 Understand that plans might change at the last minute if someone becomes overwhelmed by the unexpected triggers of grief and can’t make a dinner or outing. Be mindful. Remember to remember not just on the holidays. On important dates like birthdays and anniversaries send a note, saying that you miss the person who died. Mention their name. Families don’t want loved ones forgotten.